Shastars of Guru Gobind Singh and Khalsa Warriors at Takht Keshgarh Sahib presently. PATIALA: More than 300 years after the passing away of Guru Gobind Singh into eternity, the general public would be able to see some of his relics, which have so far remained either with the royals or locked at Patiala fort. The department of culture, archeology and museums of Punjab has finally decided to hand over the relics -- a turban, three swords, a cloak, hair with comb and a manuscript -- to the museum of Takht Kesgarh Sahib at Anandpur Sahib.Kesgarh Sahib is one of the five temporal seats of Sikhism where the 10th Guru founded the Khalsa in 1699. The relics were in the possession of New Delhi-based descendents of the royal family of erstwhile princely state of Nabha, before the Punjab and Haryana high court ordered to bring them back to Punjab in 2008. The Nabha family descendents had then admitted in the court that they did possess the relics of the 10th Guru and also wished to hand them over to the state. "After the court judgment, the state authorities had taken possession of the relics. However, since then, the relics, which are under the possession of the department, have been lying locked in the Patiala fort - popularly known as Qila Mubarak," said a senior officer of the department. 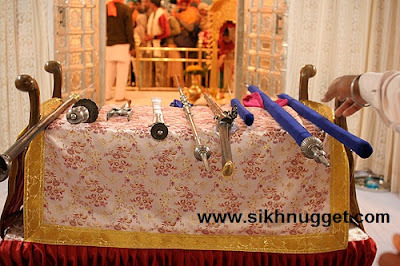 According to the Encyclopedia of Sikhism, some of these relics were with Peer Budhu Shah, a Sufi saint, whose sons and hundreds of disciples fought under the command of 10th Guru against hill chieftains. Legend has it that years after Budhu Shah's death, some of these relics eventually found their way to the family of maharaja of Nabha. During their rule, the relics were kept at Hira Mahal, the royal palace of Nabha. Confirming the decision, N P S Randhawa, director of the department, said, "These are the same relics, which were handed over by the descendents of Nabha royals to the state government, after the high court decision. We plan to shift them to the museum established in Gurdwara Kesgarh Sahib. As of now, they are safely kept in the Patiala fort." Asked about the delay of four years, Randhawa added, "Earlier, the plan was to shift the relics to Khalsa Heritage Museum at Anandpur Sahib. But since the relics are not only of historic but also of religious importance, the authorities decided to shift them to Gurudwara museum." Randhawa, however, refused to comment on how and when the relics had gone into the possession of the Nabha royal family. After the battle of Bhangani Guru Gobind Singh offered rich presents to Pir Buddhu Shah which he politely declined to accept. However he, as the tradition goes, begged the Guru to bestow upon him the comb from his hair and the turban he was going to tie. The Guru gave him the two articles and a small kirpan or sword which the Pir and his descendants kept in the family as sacred heirlooms until Maharaja Bharpur Singh of Nabha (1840-1863) acquired them in exchange for a jagir (a land grant/estate). The personal items of Guru Gobind Singh that the Maharaja traded for the jagir are still preserved in the family's palace at Nabha (in the Punjab). how is it possible that there are 2 sets of relics that are the same...Here in Los Angeles there is a family claiming to have the same set of relics. They are the the descendents of pear baba budhu shah. They also have a kirpan, kanga with Guru Gobind Singhji hair ....hair were stolen by unknown individual during showing in England. turban and a hand written hukamnama. How is this possible? ?